Delivers 24 Highway MPG and 17 City MPG! 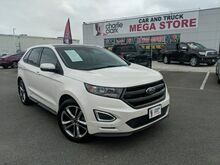 This Ford Edge boasts a Twin Turbo Premium Unleaded V-6 2.7 L/164 engine powering this Automatic transmission. Wheels: 20" Polished w/Magn Low Gloss Ptd Pockets -inc: Aluminum, Trunk/Hatch Auto-Latch, Trip Computer. Transmission: 6-Speed Automatic, Transmission w/Driver Selectable Mode and SelectShift Sequential Shift Control w/Steering Wheel Controls, Tires: P245/50R20 AS BSW, Tire Specific Low Tire Pressure Warning, Tailgate/Rear Door Lock Included w/Power Door Locks, Systems Monitor, SYNC 3 -inc: enhanced voice recognition communications and entertainment system, 8" LCD capacitive touchscreen in center stack w/swipe capability, AppLink, 911 Assist and 2 smart-charging USB ports, Strut Front Suspension w/Coil Springs, Steel Spare Wheel, Sport Tuned Suspension.